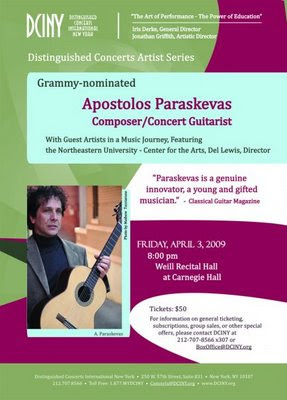 Apostolos Paraskevas, the Grammy-nominated Greek-born composer and concert guitarist known for his highly theatrical and occasionally irreverent showmanship, returns to Carnegie Hall’s Weill Recital Hall, Friday, April 3, at 8:00 PM. This concert also includes guest artists Eleni Calenos (Soprano), John Muratore (Guitar), Winnie Dahlgren (Vibes), Bahman Panahi (Setar/Tar), Neil Leonard (Soprano Saxophone), the Tantalus Guitar Quartet, the Boston Players string quintet, and Del Lewis (Actor/Narrator), all under the baton of Guest Conductor Francisco Noya. Music on the program will be by Dr. Paraskevas and Guest Composer Anthony Paul De Ritis, who is writing a piece specifically for this production. Classical Guitar Magazine/London acknowledged him as the only guitarist ever to have a major orchestral piece performed at New York’s Carnegie Hall, and the international press as the only musician who performed there in a Grim Reaper’s outfit! Dr. Paraskevas, a Lukas Foss protégé of the early 90's, studied with Leo Brouwer and Theodore Antoniou. He has had numerous of his works published, and has many recordings to his credit. As a soloist and composer he collaborated with orchestras around the world. Paraskevas has received five First Prizes in International Composition Competitions. He is the Founder and Artistic Director of the International Guitar Congress/Corfu and an Associate Professor at Berklee College of Music. To obtain tickets or further information regarding this event, please visit the Distinguished Concerts web site, www.DCINY.org. Tickets can also be purchased by calling the DCINY box office, 212.707.8566, x 307 or directly from the concert venue.